A long story with running, parenting, and life principles. An afternoon spring day called myself and two of my children on a short run/ride. It was an opportunity to get them outside and exercise. Being it was their first ride of the season, it wasn’t so difficult to persuade them to help me log a few running miles. On my son’s request, we ventured towards the high school lacrosse field, about 2 miles away. Now, when I run alongside my biking kids I tend to keep a faster upbeat pace in order to keep up. So the first 2 miles were a bit of a shock to the body and I guessed the run would stay under 4 miles. However, once at the back fields of the high school, I found a new path that I had never run on. Quickly distracted from the tougher pace, we ventured on through the town. My mind enjoyed the challenge of taking the kids to new places within the town and we found ourselves near the Aldi and Menards stores that we usually drive to. As we passed the bank that was on my errand list, I regretted not having the check I needed to deposit. Next time on a tour of the town, I will fold the check into a baggie and store it in my Spibelt to reduce driving around town. Continuing on by taking different turns than before, we ended up passing the downtown stores. I always feel silly running through downtown sidewalks that usually are trodden upon by leisurely shoppers. All this touring around the town with kids on bikes requires pauses at stop lights and slowing down as I guard them crossing streets. These breaks don't hinder my long runs because the body is still getting the miles or time on the feet. Long runs most of the time should be run at a slow, easy pace. Importantly I want to model to my community a family outdoors exercising together. Back in NY, I strived to count how many summer days I could spend time in my community without traveling by car. My children have learned how to bike safely and know their way throughout their community. It is delightful to power your own transportation. Next up was the library and town park/beach. My daughter quickly planned another run/ride that would include a stop at the library to read magazines and with a checkout limit of two lightweight books. Once we reached the playground, I left the kids to chase each other around as I circled the park twice to add in another mile. Playground hopping throughout a run/bike has been a favorite combination for my children as they have been growing up with a runner mom. With them on bikes and me by foot, we find all the playgrounds within miles. They get 10 minutes to play as I circle each park. Our neighborhood in NY was dotted with parks. I love the company and watching them enjoy the playgrounds. Before leaving the town park we plan our summer kayak trips across the lake to the beach, playground, and library. Traveling throughout town using different modes of transportation opens up many new adventures and routes. With 9 miles on my watch, I knew we had to head back home, but the only way home was around the lake. The last two miles could feel long but I knew the route would go by quickly with a distraction. 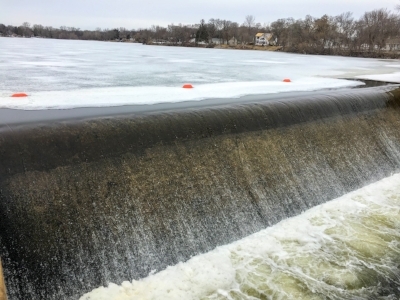 We stopped at the dam and watched the spring run-off thaw the frozen lake before it continues onto the Mississippi River a few miles downstream. What makes a run like this fun for children is the stopping and enjoying the scenes and locations. Since my purpose for the run had changed from a short usual run to a long run, it didn’t matter if it included a minute stop here and there because I was just going for a minimum running time amount. As we attempted to find a trail through a neighborhood that would create a safer route, I was able to include the kids in the decision making, which always makes the last mile seem a little easier. At last, we were nearing our house when my watch said 1:25:00. Since 5 more minutes would reach my long run minimum of 1:30:00, I didn’t skip a step as I passed by my driveway. The kids couldn’t resist the freedom and fun of biking downhill and kept on the journey with me. Fatigue was setting in and I was having to focus on just moving forward. Glancing at my watch, I realized that I would end with 11 point something miles, which would not be acceptable. So instead of the 1:30:00 planned finish, I declared that 12 miles was the new goal. With a determined mindset, I worked hard up the hills. The watch clicked from 11.99 to 12.0 and my body halted and with the rush of accomplishment and surge of tired muscle pain. This story is not an oddity in my normal life, as it happened quite similarly today on another Thursday afternoon run. When there is a fork in the road or several options in front of you, take the longest, hardest, path. This is how you become tough physically and mentally. Sprinkle fun and options into our family’s journeys. This is where memories and love grow. There are many ways to the same destination. Putting aside unreasonable guilt, I have the freedom to tailor the paths within my daily life.